This recipe is very simple, quick and super delicious (unless you don’t care for capers, but you could skip those). When I made it and started to add stuff to the sauce, it became so rich – it made the whole dish. I really enjoyed it. Hope you would too. Clean pork chops from fat but leave a little bit on. Season both sides with salt and freshly ground pepper. Heat a heavy duty pan with oil and fry pork chops on each side for 3 minutes (if thicker chops, add a minute). Take the meat out, keep in warm bowl and cover with aluminum foil. Add a little more oil if necessary and cook finely chopped shallot for a minute. On medium heat, add wine to the pan and carefully turn the pan in your hand a few times to de-glaze all the good stuff left from meat. Use a wooden spoon to scrape everything, if need. Add Dijon mustard and stir to dissolve and mix it together. Add butter and let it melt. It will add flavor and also thicken the sauce. Taste and season with more salt and pepper, if desired. Don’t forget that capers are salty, when you season. Let cook on medium heat for an additional 2-5 minutes, or until the liquid is reduced to a thicker sauce. Stir occasionally. At the end add capers and return your chops to the pan to warm it up. I have served it with broccoli rabe but you can pick your own favorite side dish. Perhaps roasted potatoes will compliment this dish. 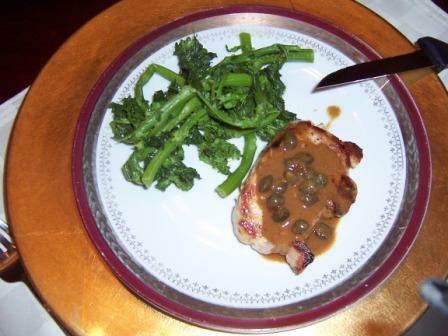 The saltiness and the distinguish flavor of capers and rich sauce of this dish matched very well with Remo Farina Ripasso from Valpolicella Classico, Veneto, Italy. The other, a bit lighter red I tried to match was Capezzana Barco Reale From Italian Tuscany. Both Italian reds worked really well.